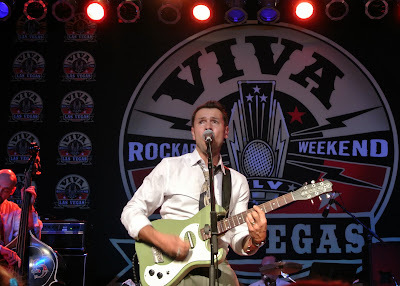 Rockabilly Weekend, Las Vegas, 2013. Oregon area Pin-up a few years back, though I never new there was a connection. I stumbled into the Bienville Room for the first set that Si Cranstoun played at Viva Las Vegas, and to my pleasant surprise I found a man with the ability to belt out tunes with utter style and control, backed up by a masterful band. Oh, and the man can dance. He played his voice like the instrument so many 50's Rock N' Roll stars used to do. Vocals weren't auto-corrected by top-notch producers in a studio, back then they were laid down clean. By Sunday of his visit to Viva Las Vegas at the Orleans Hotel, a mass amount of people had heard about Si Cranstoun and that they shouldn't miss his finale' performance in the Ballroom. I caught his second performance too and it was met with a thunderous applause from the audience, and three encores. The set was electric and like so many this year at Viva, I became a Si Cranstoun fan. With musical influences like Jackie Wilson, Sam Cooke, Elvis Presley, Nat King Cole, Perry Como, Nappy Brown, Frank Sinatra, Luciano Pavarotti, and having written his first song over 16 years ago, Si is meant to be heard by more than just a few British across the pond, he's poised to be world-wide. Here is my exclusive interview via email waves, of the "Sensation from Surrey" that is known as Si (sounds like sigh) Cranstoun. During our conversation he made sure to tell me, he will always be a music fan first. FT: Are you currently married with children in the UK in the city of Surrey where you were born? SC: Yes, it's wonderful here. FT: Your stage show is so very energetic and impressive. It's obvious you stylize your moves after Jackie Wilson and Elvis. What training have you had to create those steps? SC: Wow thanks for the compliment. Erm- wella wella wella. I've had no training. In fact I'd really like some. I just love the rhythms and the no nonsense melodies. When a man is smack bang in the middle of what he loves, he's not thinking. He's just reveling, and reveling is all I do if the music is good ! FT: Can you explain your song-writing experience working with famed Grammy winner Graham Lyle (wrote for Michael Jackson and Tina Turner)? SC: Graham Lyle offered a huge amo+unt of encouragement when I was teenager in my first school band - he really turned the path I was heading down into one of musical study. I was originally going to join the services, the RAF or the Navy. FT: You've experienced some commercial success in the UK in your previous Ska duo project The Dualers. As a solo artist do you find overseeing everything including the recordings more organic, fulfilling, and autonomous? If not what's the difference for you? SC: It has been incredibly rewarding to have free reign on the music but it did take a while to really feel completely at ease with it. My brother is and was a huge talent and I early on I felt there was this big empty space on the stage, but after a while it became more comfortable. FT: Was Viva Las Vegas 15 your first tour to the states? FT: Both your scheduled performances were received with great enthusiasm [at VLV15], what was it like to play that crowd? lifestyle. In particular, (being a red-blooded male) what also stood out were the stunning Rockabilly Pin-Up Girls. These girls had the dress, the hair, the shoes & the figures. So, I was compelled to write about it. Bernie Dexter and her legendary husband Levi Dexter had become friends and supporters of me and we all got together in England one day and Bernie agreed to be in the video. I remember she came onto the set in her jeans looking lovely, went into wardrobe, and came back out a little while later and BAM! Everyone on the set was drawling and gawping - She looked outrageously good. FT: How does having Nappy Brown's original bass player Stewart Pannaman help set the tone of your band? SC: Stew is the knowledge, he's the man. Seriously. Apart from being a great Double Bass & Electric Bass player, there ain't a thing Stew don't know about the Rockin' Scene & Vintage R&B. The band are serious. There's no drugs or alcohol here—we are on stage to serve the public to best of our abilities. FT: You are describing the new album "Dance Halls and Supper Clubs" (July 2012) as having the "melodies up-front, and the pulse dance friendly." That's a great niche to hold. Can you tell us more about it, and what musicians are featured on on the album? SC: On the album we have a super talented piano player Paddy Milner. This man can play the piano, WELL! I'm talking about hitting the right keys in the right order at the right time! Paddy is gifted and I'm so proud and lucky that he was in the country to record for me. We also have a my mighty mighty brass section Dan Faulkner-Sax, Jon Radford-Trumpet, and Bob Dowell-Trombone. These guys could make a racket like a great big band and then go on to sound like they were out on stage with Louis Prima. Then there's "Mez" Mighty Mez on drums thumping down the beats. Yeah baby - thump that rhythm - cuz the feet's got to dance! FT: When can we expect to see Si in the U.S. again? Please say soon. SC: Well I really hope we can get something together. We'd love to tour the west coast, we just need to source the right promoter. Someone sensible that can make it cost effective for the venues and of course my band and myself. If you're out there contact the website immediately [SiCranstoun.com]. Si Cranstoun is scheduled to play at Viva Las Vegas Rockabilly Weekend March 28-31, 2013 Orleans Hotel, Las Vegas. One thing often said about Dita Von Teese, is that she spawned the modern Burlesque movement. Whether you agree or not, Dita Von Teese has dominated Burlesque and high-fashion for almost a decade, with styles from the Turn of the Century, to the 1950's. Her milky white skin and waify yet curvy figure, are dreamy for fashion designers to work with, and easy on the eyes. The show known as Strip Strip Hooray began in 2010 with a few select engagements leaving fans drooling for more. Luckily more they shall get. The 2012 tour is set to begin May in Los Angeles, and continue to San Diego, Las Vegas, San Francisco, Seattle, Portland, and Orange County. Audiences will be delighted to see more of the fantastic two legged Burlesque Ballerina who learned her Martini glass moves from original showgirl "Catherine D'lish", one of the world's leading exotic female performers, and a gorgeous red-head, who will be among the show's stars. Other lucious tour cast members include: MC Murray Hill, Dirty Martini, Lada, Selene Luna, Perle Noir, and Monsieur Romeo. Whether you like the riding of the pink bull, the martini glass routine, or her fan dance, Dita will be bringing it to you in high style set to amazing musical accompaniment. It's wonderful to see a star such as Dita Von Teese, who is also a style leader of this century, billed as the diamond in a traditional variety show setting, a show format that is fast-paced and has been proven to stand the test of time. The rave revues of Strip Strip Hooray are still resounding from 2010, and this tour will be met with the ferver that Miss Teese deserves, without a doubt. Creating gorgeous Dita clones around the world, there have been many an interview where Dita states that one of her delights is seeing women who adapt her style show up to the shows. Besides her entertainment value, she's creating beauty everywhere she goes. Viva Dita. House of Blues at Mandalay Bay, Las Vegas, $62, May 17-19, 2012. Rob Riggle has a manic professional talking head style of hilarity that can crack anyone's smile, make them proceed directly to giggles, and lead them promptly to gut laughs. His successful jump from sketch comedy to Stand-up came in 2006, when he toured nationally with now famous John Oliver and other Daily Show writers. Sarcasm is his middle name, and his delivery never falters. You may have also seen him on Saturday Night Live circa 1994/5, among the many other TV appearances and roles he's played. Rob Riggle Jr. has also appeared in several box office success films including 'The Hangover'. He's known for tying in jokes and skits about his actual role as a Lieutenant Colonel of the U.S. Marine Corps. He uses his knowledge to act as the 'Military Analyst' on the Daily Show with John Stewart, a character that gets endless mileage and laughs. His stand-up videos indicate he's a top-notch story teller. His life leaves him no shortage of fascinating things to talk about, including the 'first draft' of his hypothetical Academy Award Acceptance speech with lines like "the world is my toilet". 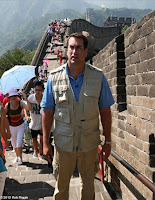 Riggle was born in Midwest United States, and his go-to topics include Sports, the Military, Politics, and the News. His hilariously written stories about real and fake happenings have kept the Riggle fan-base growing from his early 90's work to his current stand-up. His role with Will Farrel in the film Step-Brothers didn't hurt much either. Comedy geeks may remember UCTB (The Upright Citizens' Brigade') in which Riggle and his hilarious partner Rob Huebel performed their two-man show 'Kung Fu Grip'. 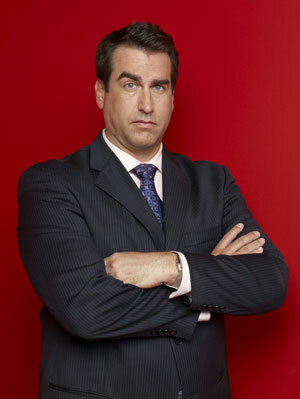 Riggle also appeared often with his partner on Late Night with Conan O' Brien for comedic sketches during the '90's. He's worked with the best. His recent projects have included a collaboration with long-term partner Robert Huebel and Paul Sheer, including Seasons one and two of HBO's Designated Driver and Death Hunt 2010 and 2011. 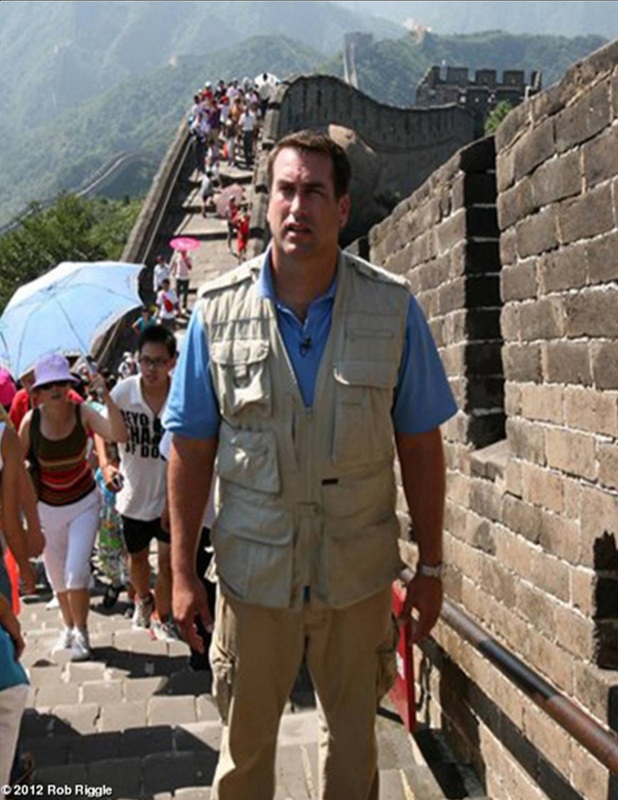 With organizations like NFL, HBO, SNL, Comedy Central, CBS, Nascar, Bravo, and the Marine Corps on his resume', Riggle has shown his mass appeal, and longevity through many outlets. He's just five years into traditional stand-up, but decades in comedy. This is one of the funniest observational comedic sarcastic writers and character comedians around. His insights are original and familiar at the same time. Riggle's three night stent at Paris will be a brush with a professional long-term comedian, who has avid fans throughout the United States, plus his name, Rob Riggle, is super fun to say. May 10-12, 2012. Empire Comedy at ParisLasVegas.com, $39.99-$59.99, (702)777-7776.